− one = seven Required Please enter the correct value. Some of these headwinds include a rallying dollar and an inflated stock market, according to Money Morning Resource Specialist Peter Krauth. "The investing herd has been flocking to these asset classes," he said, "discarding silver along the way." But silver is also largely undervalued right now, Krauth says. The gold-silver ratio is currently at 70, which means that it takes nearly 70 ounces of silver to buy one gold ounce. According to Kitco, this ratio is up from 55 nearly five years ago. That suggests silver's value has been depressed for some time. Despite the short-term headwinds, there are several reasons why the precious metal has such high growth potential in 2017. And silver has even more growth potential than gold right now. Silver's "safe haven" appeal as an alternative to the dollar will increase in 2017, according to Krauth. For one, President-elect Donald Trump is promising massive tax cuts – both for corporations and individuals. He is also promising a trillion-dollar infrastructure spending plan. Both of these promises have helped send the markets to new highs. But over time, Trump's spending plan, along with rising bond yields, signal higher inflation. "When that reality begins to sink in, investors will quickly flock to silver and bid it up to new heights," Krauth said. You see, silver acts as an alternative investment to most other asset classes, like stocks. And right now, stocks are occupying investors' attention. But over time, higher inflation will increase silver's appeal, especially compared to the U.S. dollar. The dollar has been appreciating heavily ever since Donald Trump's election victory. Since Nov. 8, the U.S. Dollar Index (DXY) has risen over 4%. And with an expected rate hike coming at the Federal Reserve's Dec. 13-14 meeting, the dollar could keep appreciating slightly. While this will likely put downward pressure on silver prices in the short term, Krauth still says he expects higher inflation "to come back with a vengeance." And when it does, silver prices could run up to the $19 range by the first quarter of next year, he says. 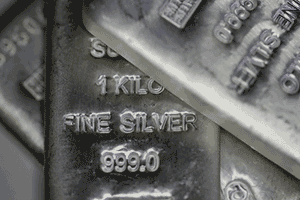 Looking even farther ahead, Krauth said silver could climb to the mid-$20 level within six to nine months. Silver is currently trading at $17.29 per ounce as of Wednesday intraday.